Carolyn Knits: Something is coming...& Something is here! Something is coming...& Something is here! I am just about ready to release a new design. It is an infinity cowl that I have named "Seabreeze". It has been over two years since I knit my "Seabreeze" sample (one of my personal favorites). I have submitted Seabreeze three different times for consideration to third-party publishers with no success. I have decided that, now, it is finally time to let it see the light-of-day! Seabreeze is a completely reversible, two-color, garter stitch infinity cowl with a knit-as-you-go garter stitch edging. You might notice that the edging is the same one that I used in my Paper Lanterns design. Seabreeze and Paper Lanterns will always be linked in a buy-one-get-the-other-for-a-discount on Ravelry. Stay tuned for more details. MY VERY FIRST TRUNK SHOW! Now through next Saturday October 17, seventeen of my knit design samples will be on display at my LYS Gosh Yarn It! in Kingston, Pennsylvania. I have to thank my good friend Catherine who works at GYI! The Carolyn Kern Designs Trunk Show was her idea and she proposed it to the shop manager, Ann, without even telling me. What an honor it was when Ann asked me if I would like to do this! During the Carolyn Kern Designs Trunk Show at GYI! 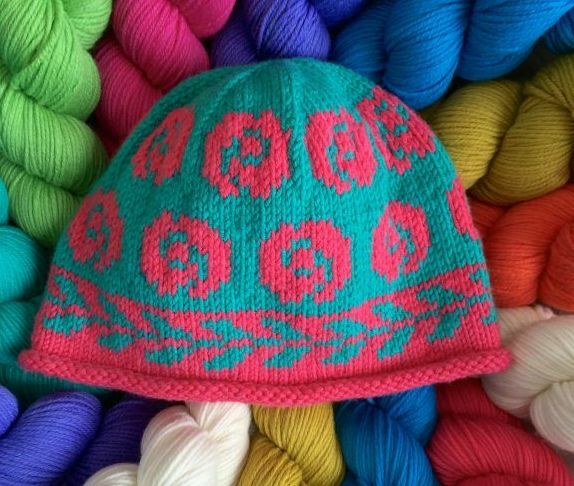 an advance copy of my next newest design called Floribunda Cap will be free with a yarn purchase. BTW, this pattern will also be free to all students taking my Floribunda Class on two-handed stranded knitting at Gosh Yarn It! Saturday November 7, 1:30-4:00. Last I checked there were still three open seats. See Ann's September GYI! Blog Post for details on this and all of the upcoming classes at the shop. Lovely new cowl design, Carolyn. Congratulations of your trunk show! That's great.